Diggerland USA Review: Every Boy’s Fantasyland… And His Dad’s Too! 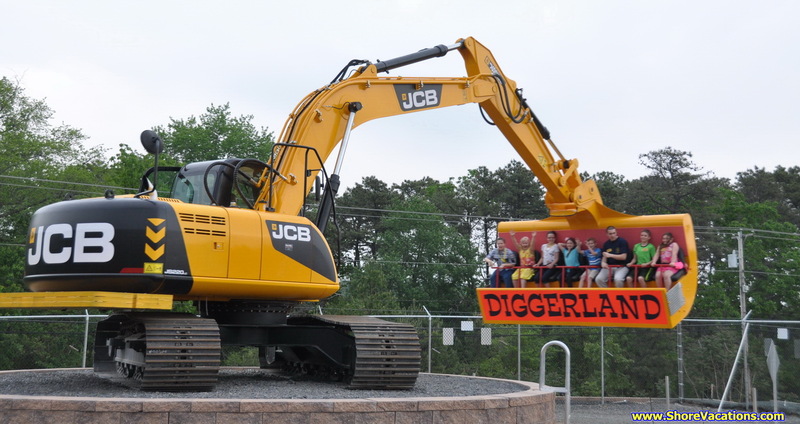 A review of New Jersey's hottest new attraction, Diggerland USA, a construction-themed amusement park. 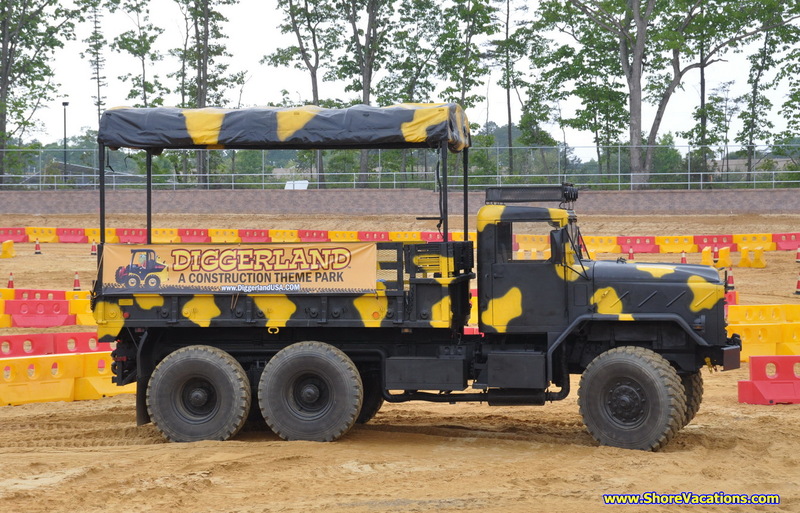 Located in West Berlin NJ, next to the Sahara Sam's Oasis waterpark, Diggerland featured rides based on real-life construction machinery, from diggers, excavators and backhoes to tractors, dumpers and skid steers that customers can drive around dirt tracks. Diggerland USA opened in 2014 as America’s first construction-themed amusement park, and I visited it with my 4-year old boy, both of us anxious to try all those big diggers. This is the first construction-themed park in North America, replicating a successful idea coming out of Great Britain. It is something unique and different from everything else around here. It doesn’t have the same cookie-cutter rides you find in all the amusement parks around New Jersey. Every ride is based on a real construction machinery and a “ride” means riding a machine around a dirt track. Diggerland NJ is located on Cooper Road in West Berlin, NJ, right behind the Sahara Sam’s Oasis water park. You can check out our photo albums from this trip, and from the media day. My boy probably had the most fun in the Mini Land Rovers, which can fulfill a kid’s biggest dream: to drive his own car. 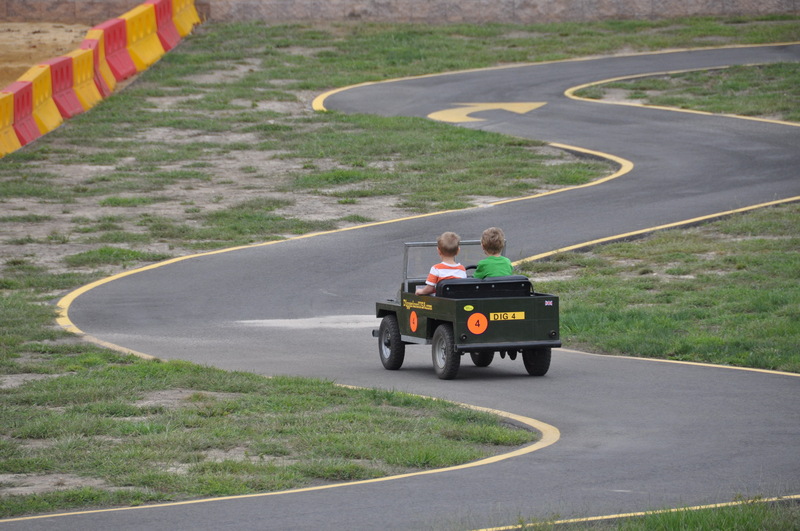 The small cars go along a winding track and kids over 42″ can drive all by themselves, even with a smaller passenger. It is pretty awesome, since most of us didn’t have a closed track to test drive a car as young as 4-years old. My boy had a blast, he managed to keep the car in the middle of the road, and he wanted to go several times on this ride! Next to it there’s another track for the Turnpike Tractors. Here the parent has to drive and you have to be 42″ to even be a passenger, but it was fun for both of us! The track is similar to the mini-cars, but a bit longer, and what kid wouldn’t like to ride on a big tractor? One of the main attractions of Diggerland are, of course the Diggers.There’s a long line of more than 20 excavators, each with its own challenge. We tried the standard one, where you dig into the sand. The excavators are static, but you have full control of the scoop, and that’s not an easy thing! There are 4 different moving parts you have to control with 2 levers, so it requires some time to master it. The challenge we had was to dig out some bricks from a pile of sand, which was very fun! At the end of the park there are some rides not fit for little kids, so we had to skip them, but they look quite impressive. The Sky Shuttle has a telescopic arm that lifts the passengers very high up in the air, around 50 feet or more. Spindizzy could be the flagship ride, with 8 seats in a giant digger scoop, which spins around extremely fast. Dig-A-Round looks more like a traditional amusement ride, with people just going around in their seats. Something even the younger kids can enjoy is the big play area. You’ll find there a climbing wall, and a massive playground with slides of all sizes, but the most impressive is the huge rope course, an 8-floor structure where kids can climb, navigate netting bridges and zip down the lines back and forth. Back to driving diggers, we went on the Mini Dumpers. My son could stay on my lap and drive it himself, so he was very happy. The dumpers go around a dirt track with concrete barriers, but it wasn’t that hard to drive them around. They are articulated vehicles, so you steer the front part, and the cab where we stayed would follow. Next to them were the Skid Steers, a bit more different. Instead of a wheel, they’re operated with a joystick. It was a bit too complicated for the 4-year old, so I had to be the one having fun with it (while he watched from my lap). The track is longer, with more turns, and with bigger muddy portions. But it was still very cool covering the course. 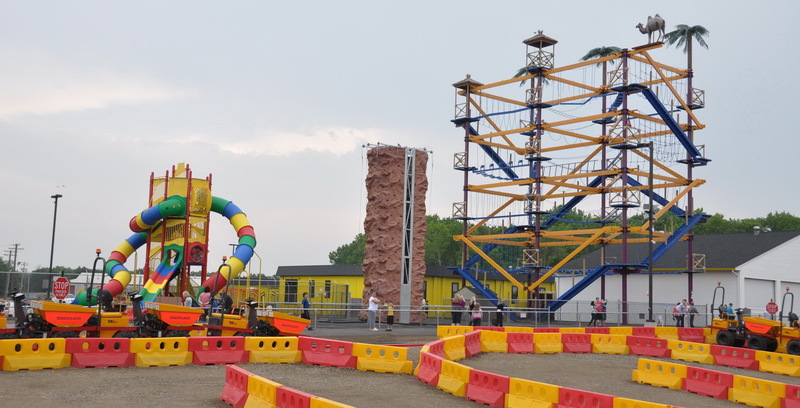 Almost every amusement park has a leisurely train ride, and Diggerland has the Excavator Express, a couple of cars pulled by a mini-dumper which goes on the roads in the back of the park. You can get a nice view of the backhoe and truck courses, with all the other big rides in the back. The cars have seats raised towards the back so everyone can get a good view. Probably one of the top attractions at Diggerland is the Backhoe Adventure course. 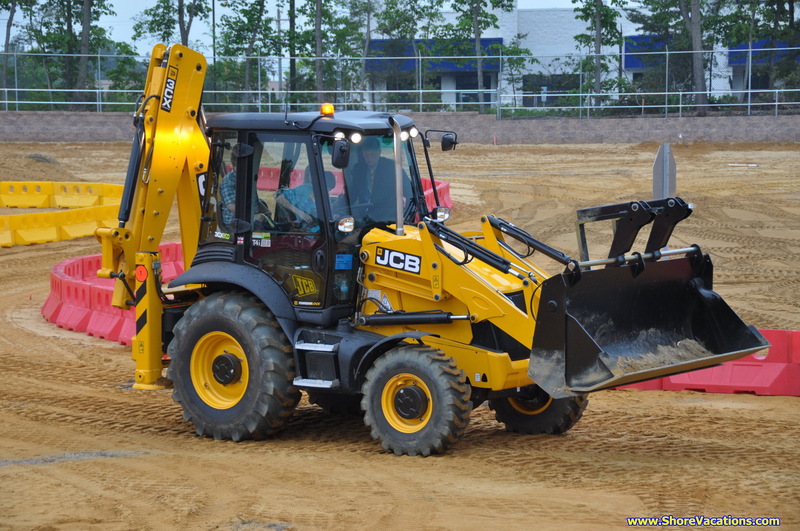 Each backhoe can take 3 passengers, who take turns driving it on a dirt track. My 4-year old was too short to drive, which doesn’t mean he couldn’t have a lot of fun in the backseat. But dads will find it very exciting driving the massive backhoe on the obstacle course. Next to the backhoe it’s the Ground Shuttle, a more kids-friendly version of the Sky Shuttle: a digger with a seating platform at the end of a short arm, which lifts the passengers only about 10 feet of the ground, then does a small loop with them. There are also the Battle Trucks which we didn’t ride, and which look very similar to the Great Adventure safari trucks. And then, as you exit through the store, you can buy a variety of toy construction vehicles, mostly diggers of all kinds. The store is pretty cool, it’s models you don’t usually see in regular toy stores, and they’re pretty high quality, especially the JCB and Bruder ones. Some of the bigger rides require minimum 48″ height, but many of them allow lap-riders to be 36″ or 42″, so little kids can go with their parents. I’m amazed! Probably more excited than my 6yr old champ would be when he gets to see this. Thank you guys! For showing me our next holiday destination. This amusement park unlike any other is theme oriented especially for heavy machine crazies like my son and me. Looking forward for this trip.